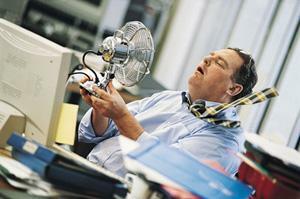 Let ESI help you beat the summer heat! - Environmental Systems, Inc.Let ESI help you beat the summer heat! - Environmental Systems, Inc.
Let ESI help you beat the summer heat! Summer is in full swing, bringing plenty of heat, humidity, and discomfort to New Englanders. According to the International Facilities Management Association, there is a direct relationship between comfort and worker productivity. Since workers’ salaries constitute one of the largest costs of running a business, even a small increase in employee productivity can substantially increase a company’s financial return. Change your air filters regularly– Regular filter changes are one of the most important steps you can take to keep your HVAC systems running efficiently. The change will create better cooling results and provide better air quality for you and your employees. Get semi-annual inspections of equipment– Twice yearly inspections by a licensed professional can shed light on leaks and inefficiencies that that can cause improper airflow, or worse, costly repairs down the road. Keep evaporator and condenser coils clean– Dirty coils can reduce the cooling ability of your system and cause it to run longer. Install programmable thermostats – Pre-programmed thermostats can help maintain a consistent level of comfort throughout the work day, while saving energy during off-hours. Have moving parts lubricated – Moving parts that aren’t lubricated can cause additional friction which, in turn, can cause the system to use more electricity. Call ESI’s Service department today for a comprehensive diagnostic test of your system or for a quote on preventative maintenance programs!